Laura Collett has been selected for the British team for the European Eventing Championships, two weeks after the death of her dressage horse Kauto Star. 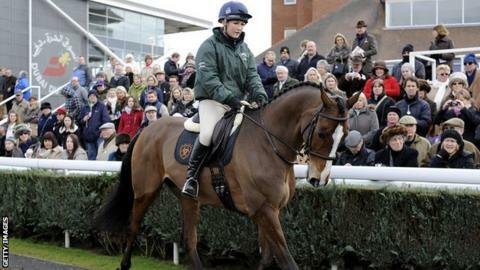 Collett, 25, spoke of her devastation when the two-time Cheltenham Gold Cup winner was put down after a fall. She is joined by veteran William Fox-Pitt, 46, in the 12-strong team for the event at Blair Castle, Scotland, which starts on 10 September. London 2012 silver medallist Zara Phillips has not been included. Dani Evans, Pippa Funnell, Flora Harris, Kitty King, Gemma Tattersall, Izzy Taylor, Oliver Townend, Francis Whittington, Nicola Wilson and Holly Woodhead complete the GB squad. The European Championships are the last major competition before selection for the 2016 Olympics in Rio. Kauto Star had moved to dressage after a successful steeplechase career, but was put down after suffering neck and pelvis injuries in a fall.